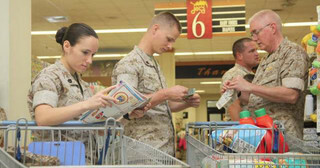 Finding coupons for the commissary on Wright-Patterson Air Force Base just east of Dayton, Ohio, isn’t always easy, but at MyMilitarySavings.com, we’re committed to simplifying savings for military shoppers. We understand how difficult it can be to find time amidst the hustle and bustle of military life to scour dozens of websites for coupons on the items you need. That’s why we’ve gathered discounts from all over the internet into a single, user-friendly website, allowing you to access all kinds of deals on your favorite items from the commissary. Additionally, we’ll send you a weekly e-newsletter with links to digital copies of the latest Price Connexion and Coupon Connexion. That way, you can plan ahead for your next trip to the commissary, rather than waiting until you get to the store to see what items are on sale. To find out more about the many commissary discount opportunities you can take advantage of for your next shopping trip on Wright-Patterson AFB, enroll for your free MyMilitarySavings.com account today.